After a stirring one-point win over the Hawks last night, the Lakers find themselves in a place they haven't been since Dec. 28: at .500. This means you can no longer objectively call them a bad team. You could call them an average team, but they've been on a quiet roll for more than a month. Back at 15-15 entering 2013, everything collapsed. The Lakers spent January losing, dropping 10 out of their next 12. (Eight of those losses came at the hands of teams nearly certain to make the playoffs.) But since a players-only meeting on Jan. 23rd, almost everything has gone right: a 13-5 stretch, capped off by last night's great escape against Atlanta. 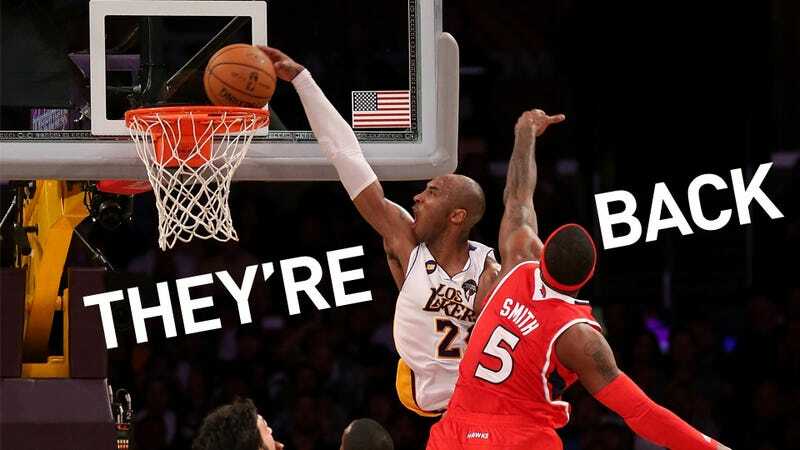 A dunk on Josh Smith brought a bit of electricity to the Staples Center, but Bryant naturally downplayed the type of explosiveness we haven't seen from him in a few years. "Once I turned the corner on him, it was just a matter of if the help was going to get there in time to take a charge." "I was in my coffin a few years ago. I've got plenty in the tank, but if y'all want to feel free to criticize and say I don't, go right ahead." This is how Bryant functions; on perceived disrespect. Even when he shreds guys a decade younger, he's still eyeing reporters, daring them to call it improbable. Thirty-four points sounds like young Kobe, but that's not how the Lakers are winning. A lot has changed since the start of 2013. Pau Gasol went down, which has made Bryant and especially Dwight Howard noticeably happier. Jerry Buss died. Most importantly, Bryant has been called in for support duty. Oftener and oftener, he finds himself defending the other team's best scorer—a role Mike D'Antoni specifically wants him to play. He's publicly chafed at the new offense, which requires more assists from him than he's used to—"I don't like passing as much as I'm passing either but I have to do it in order to win." It's working. Before the Lakers' hot streak, Bryant was averaging more than 28 points per game. Since they've run off 13 of 18, he's down to under 23 ppg. He's replaced his production elsewhere, handing out nearly two more assists and claiming two more rebounds than his previous season average. (Antawn Jamison and Earl Clark have been the largest beneficiaries, both of Bryant's largesse and Gasol's minutes.) Most importantly, the defense is working: the Lakers allowed five opponents to top 100 in February, compared with nine in January. The offense is still flawed—Los Angeles turned the ball over 21 times last night, and did nearly squander a 16-point lead. The Lakers are still two-and-a-half games out of the playoff picture, since Houston keeps winning. But other teams haven't kept pace in the 10 days since Bryant guaranteed playoffs. L.A. is just three games back of the six seed.